Like almost all of the other products released by Apple, the Mac is a popular device. Many consumers prefer Apple computers because they offer functionality that you can’t get from windows. A lot of people use the Mac because it’s user friendly and doesn’t suffer from many of the software errors that make Microsoft Windows difficult to use. If you own an Apple computer, then you’ll need a keyboard for your Mac. The only problem is the endless selection of keyboards to choose from. Fortunately, if you know what to look for, it’s quite easy to find the best keyboards for Macs. Before you start browsing products, there are some important considerations to make. First, you’ll need to consider whether or not you want wireless connectivity. Consumers have spoken and forced manufacturers to start making wireless keyboards. The wireless technology can give you unmatched mobility, but you might not get the same performance as you’d get from a wired Mac keyboard. Before you decide on a product, the functionality should be considered. A number of keyboards are very simple and offer basic functions. Although they don’t offer some of the advanced key functions and macros, basic keyboards are much easier to use and don’t require nearly as much brain power. If you choose a simple keyboard, you don’t have to spend as much time getting used to the positioning of the keys. Style is also important because you’ll have to look at the keyboard frequently. Most keyboards for the Mac are naturally slim, and they’re almost always colored grey. However, some manufacturers make ultra-thin keyboards, so you’ll need to decide how slim you want the keyboard to be. To make sure that you get the most out of your computing experience, you need to decide if you want convenience keys. A number of Mac keyboards are made with convenience keys, which allow you to adjust the volume, brightness and disc tray. When it comes to computing, functionality is important, but it’s important to strike a balance between functionality and convenience. There are several Mac keyboards that are made with built-in USB ports, so you get additional functionality. Before deciding on a specific model, you should consider the price. Cheaper keyboards might not have some of the advanced features that you’d get from expensive alternatives, but if you’re looking for basic functionality, they should get the job done. Here’s what we think are the best keyboards for apple macs. We have tested so many keyboards in this category and here are the top rated. One of the top products on the market is the Apple Wired Keyboard. Once it’s connected, this keyboard allows you to access a variety of different Mac features. You can use it to rewind, play and pause content, and it even lets you expose the dashboard. For extra functionality, it has two built-in USB ports, so you shouldn’t have any trouble getting it connected to different computers. Since this is an ultra-thin keyboard, it looks good and doesn’t make it difficult to hit specific keys. It has an anodized aluminum enclosure, and the low-profile keys can make it easier to type. 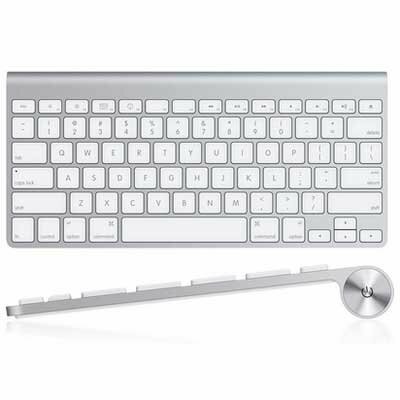 Unlike some alternative products, this keyboard has several convenience keys, which make it easy to quickly adjust your Mac’s volume, screen brightness and disc tray. It has a numeric keypad and delivers a responsive, crisp feel. The function keys provide one-touch access to several Mac functions. With an extended layout, it offers document navigation controls, and there are several keys that are particularly useful for games. Two built-in USB ports make it possible to connect a printer, mouse or digital camera. However, since it’s a wired keyboard, you won’t benefit from the freedom offered by wireless connectivity. Another top rated keyboard for Mac is the Apple MC184LL/B. Since it offers wireless connectivity, it gives you the freedom to type from almost anywhere. The wireless functionality is especially useful when you’re operating your Mac through a large display. For example, maybe you’ve decided to hook your Mac up to a 60-inch television. Although wireless connectivity can be very beneficial, it doesn’t make a product an automatic win. In fact, many consumers would rather use a wired keyboard. With its built-in Bluetooth technology, this keyboard can be used up to 30 feet away from your Apple computer. It has an ultra-slim design, so it looks good. When compared with many full-size keyboards, this product is 24 percent smaller. Unfortunately, since it’s a wireless product, it must get power from somewhere, so you’ll need to supply it with two AA batteries. This keyboard is ideal for the Mac, but it will even work for the Apple iPad. Like all Apple products, this keyboard features a simple, elegant design, and it’s designed to withstand everyday abuse. The only problem with this product is the lack of the arrow keys and numeric keypad. 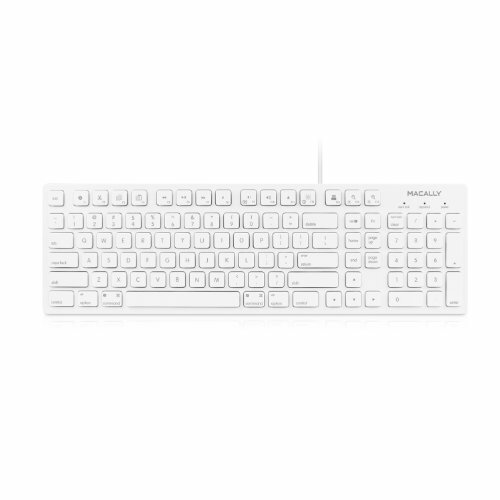 If you’re looking for one of the best keyboards for Mac and don’t need advanced functionality, this product is worth considering. If you’re looking for an RGB keyboard for Apple Mac, the DBPOWER has plenty to offer. It has 104 different keys, so there is no shortage of functionality. It’s a wired keyboard and plugs into a convenient USB pot. When the keyboard is turned on, it features six different colors, and the animated LED lights can be very pleasurable to look at. Since it’s a gaming keyboard, it offers several features that you wouldn’t get from a standard keyboard. Although it’s compatible with the Mac, the DBPOWER mechanical gaming keyboard can be used for other types of computers. You get six different flashing modes for the lights. Some of these modes are breathe, Z-type, scroll and ripple. The illuminated lights help to improve your gaming experiences, but they also make it easier to see the individual keys. All of the keys are built into an alloy aluminum chassis, which is smooth and comfortable. The chassis is even designed to resist water. The adjustable backlighting makes this keyboard a popular product among Mac users. The only potential downside is the enter button, which isn’t preferred by many computer users. Here is another top RGB keyboard for Macs. Like similar products, it has 104 individual keys, and for your enjoyment, it has RGB backlighting. When used for gaming on the Mac, it’s capable of delivering an immersive experience. If you’re looking for colorful typing, this could be the perfect keyboard. It has blue switches and produces an audible click sound. The individual switches are great because they offer accurate, responsive key commands. Once you have this keyboard in your possession, you can choose from a variety of unique lighting effects. There are even presets for popular games, which is a huge bonus for prolific gamers. The tactile keys are very responsive, and they give you total control over your computing experience. The pre-loaded RGB lighting patterns can make your computing experience much more interesting. 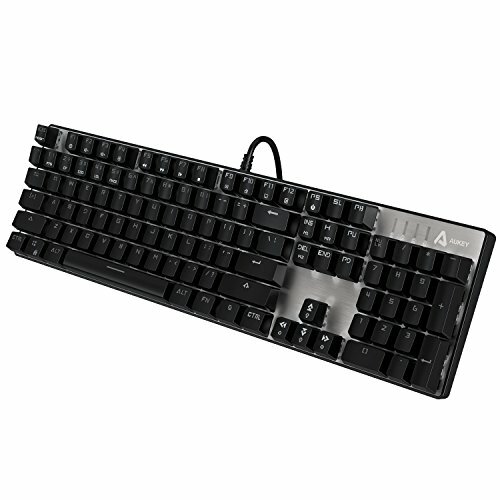 If you’re an avid gamer or love to type, this keyboard is worth considering. It delivers a faster response rate than many of the alternatives and works well for the Mac. The expected lifespan of the keyboard is 50 million keystrokes. The only potential downside is that the cord isn’t made of nylon. Overall, this is one of the best RGB keyboards for Mac, but it’s not the cheapest product on the market. 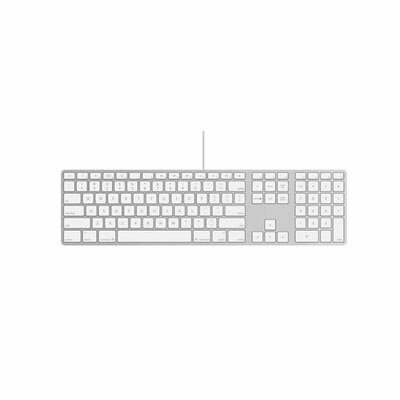 Here is a cheap keyboard for Apple Mac computers. If your original keyboard broke, this product can serve as a budget replacement. Although it’s one of the cheapest keyboards available, it comes with 103 individual keys and has a numeric keypad. With 15 different shortcut keys, you can perform several convenient functions with your Mac computer. There is even a built-in key for iTunes control. 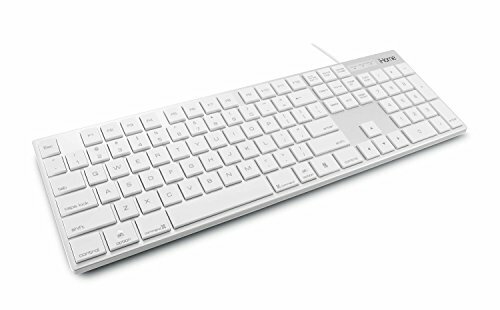 Unlike some of the alternatives, this keyboard doesn’t require drivers, so you can plug it into your Mac and start using it immediately. It has low-profile keys, so you can enjoy a comfortable, quiet typing experience. This is especially important for students because it’s quiet enough to use in a dorm room. The Macally USB keyboard is wired, and it must be plugged into your computer’s USB port. Once you’ve plugged it in, you’ll see that it functions like any full-size keyboard. Each individual key is designed to be tactile and features a low-profile design. Since the keys are punctual and responsive, this keyboard can make typing especially enjoyable. Here we have another cheap keyboard for Mac computers. The style of this keyboard leaves much to the imagination, but if you’re looking for basic functionality, this product shouldn’t disappoint you. With a brushed-aluminum finish, this keyboard delivers an executive style, and it’s a great choice for Mac computers. Since it’s a full-size keyboard, you get 110 different keys. It has a full numeric keypad, which is ideal for finance applications and spreadsheets. The iHome Mac keyboard runs on a wired connection, so you’ll need to plug it into a USB port. Unlike some other products, it doesn’t need to be synced with your Apple Mac computer. Although it’s a full-size keyboard, it’s designed to save space. The compact design could be particularly useful for tight workspaces. One of its greatest features is the anodized aluminum finish. For quieter typing and convenience, it has low-profile keys. The ultra-slim design makes this keyboard ideal for most office workstations, but you should be able to use it anywhere in your home. If you’re looking for a top-notch mechanical keyboard for Mac, this is one of the best products that money can buy. It’s a German-engineered product, and the key switches have gold contacts. To prevent fading, the keys have been etched with a laser. This keyboard has all of the Mac function keys that you’d expect, so you can adjust the screen brightness, volume and video settings. It has a two-port USB hub, which is great for charging your iPhone and iPod. The USB hub is compatible with a variety of devices. If you’re a fast typist, you’ll love this keyboard’s five-key rollover. It’s also an excellent feature for gamers. It has a glossy black upper enclosure, and there is even a matching black USB cable, which has a length of 6.6 feet. Although this mechanical keyboard works well with Mac, it’s compatible with most other operating systems. Here is another top mechanical keyboard for Mac. It has certified mechanical key switches, and to enhance the overall experience, it offers click tactile feedback. If you decide to purchase this keyboard, you might never need a new one because each key is designed to last for 50 million keystrokes. For maximum durability, the aluminum chassis is reinforced with a steel plate, so this keyboard can take a serious beating and continue to provide an exceptional typing experience. The Nixeus Moda Pro mechanical keyboard has polished edges, so it sports a premium appearance and should look good on any office desk. Each key is mounted onto a military-grade metal plate and appears to be floating. When compared with the keys on a normal keyboard, the key switches on this product last 10 times longer. Apple Mac computers continue to gain popularity, so manufacturers have started making keyboards that are compatible with Mac. Whether you’re testing the latest game or typing up a research paper, a high-quality Mac keyboard can dramatically improve productivity and satisfaction. The products that have been mentioned above are some of the best options in their respective categories, so regardless of the choice, you should be happy with the product. You might also want to check out our other buying guides that have loads and loads of product suggestions on many different keyboards for different uses. If you do a lot of typing either at work or at home, then you’ll love our guide on the best mechanical keyboards for typists.